ANDINA Minerals Inc. (TSX VENTURE:ADM) ("Andina" or "the Company") is pleased to report that drilling results from the Company's Volcan Gold Project continue to increase the dimensions of the West Zone. The recent assay results, summarized in Table 1 below, include 126 metres grading 1.05 grams per tonne ("g/t") gold from reverse circulation ("RC") drill hole ROA-19 which was drilled on the same section as RC hole ROA-04 which returned 116 metres grading 1.01 g/t gold (see Andina press release dated May 1, 2006). Andina's Volcan Gold Project is located in Chile's Maricunga Gold Belt, 170 kilometres east of Copiapo, Chile and 23 kilometres northeast of the Refugio gold mine. With winter approaching in the Chilean Andes, drilling activities have been halted for the season. Andina is presently preparing a revised resource estimate, incorporating all of the drilling results to date, which is scheduled to be released during the third quarter 2006. Also, over the upcoming months, Andina will be conducting preliminary metallurgical testing on a suite of samples from the Volcan Project. The 2006/07 definition drilling program is planned to commence in October 2006. Since the commencement of the West Zone definition drilling campaign in March 2006, Andina has drilled 5,865 metres in 23 drill holes. Table 2 (see attached) summarizes the significant West Zone drill assay results returned to date. The campaign focused on determining the limits of the gold mineralization over the southern 500 metres of the north north-easterly striking West Zone, which has been traced on surface over a strike length of approximately 1,500 metres. Within the southern 500 metre section, drilling has confirmed that the West Zone is comprised a large hydrothermal breccia system up to 300 metres wide that hosts at least two sub-parallel gold mineralized zones which combined vary from 50 to over 150 metres in width. The gold mineralization has been traced to a depth of approximately 300 metres. The recent drill results, summarized in Table 1, include diamond drill hole DOA-08 which cut both of the mineralized zones but which unfortunately was terminated at 182 metres before reaching the core of the westerly gold zone ending in +0.5 g/t gold. The drill hole will be extended. DOA-08 was drilled on the same section (section 600) as drill hole DOA-09 (174 metres grading 0.95 g/t gold) and DOA-05 (84 metres grading 1.09 g/t gold). Drill hole ROA-19 returned 126 metres grading 1.05 g/t gold from section 500 (100 metres southwest of section 600) from the westerly gold zone. Unfortunately ROA-19 was lost at a depth of 198 metres before reaching the second zone. Both RC drill holes ROA-17 and ROA-20 were drilled to shallow depths, 70 and 130 metres respectively, in preparation for being deepened next year with a diamond drill to the intended target depths. Although the main targets will not be tested until next year, both holes still returned significant intervals of gold mineralization. 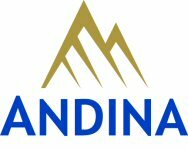 Andina is an Americas focused exploration company with a portfolio of precious metals exploration projects in Chile which is dedicated to maximizing the value of its exploration assets through a disciplined and fiscally responsible approach exploration. The Company is earning a 100% interest in the Volcan project by undertaking certain work commitments and making a series of escalating payments ending in 2008. Under the guidelines of National Instrument 43-101, the qualified person for the Volcan exploration project is Eduardo Magri, Ph.D. in mining engineering (Witwatersrand) and a Fellow of the SAIMM with over 30 years of industry experience. Mr. Magri has approved the exploration program and established the quality assurance and quality control programs to ensure the accuracy of the collection and analysis of samples. The reverse circulation ("RC") chips and diamond drill core from Andina's ongoing drill campaign are collected at the drill under the direct supervision of Andina staff. All samples are appropriately logged, tagged and securely stored prior to shipping to Asesoria Minera Geoanalitica Ltda. 's ("Geoanalitica") laboratory in La Serena, Chile. Samples are processed and analyzed for gold using fire assay techniques with atomic absorption finish. Samples which returned gold values greater than 1.00 gram per tonne are re-analyzed by Geoanalitica using fire assay techniques with a gravimetric finish. Duplicate samples are inserted at a rate of approximately 5%. Andina also inserts standard samples within each sample batch to ensure laboratory quality control procedures. Occasionally Andina requests Geoanalitica send samples to ALS Chemex in La Serena, Chile for 47 trace element analysis using ICP. Technical Reports titled "Technical Report on the Volcan Gold Project. Region III, Chile" dated November 2005 and "Technical Report on the Volcan Gold Project. Region III, Chile" dated April 2006" summarizing the October 2005 and February 2006 resource estimates are available at www.sedar.com. Further, a summary of the work performed by the previous operators is reported within the Company's Technical Report titled "Review of Gold and Copper Exploration Potential of Mineral Properties in Chile" dated November 12, 2004 which was filed at www.sedar.com on November 24, 2004. All reports are also available on the Company's website noted below. Certain statements herein that are not historical facts are forward-looking statements, including statements as to timing and extent of exploration programs and of resource estimates. As such, these statements address future events and conditions and so involve inherent risks and uncertainties, as disclosed under the heading "Risk Factors" in the company's recent Management Discussion and Analysis filed with Canadian securities regulators. Actual results could differ significantly from those currently projected as a result of, among those factors, adverse weather, regulatory changes, delays in receiving permits, delays in completing exploration activities and accidents, not all of which are in the control of the company. The forward-looking information contained herein is the company's reasonable estimate today of future events and conditions, but no assurance can be given that such events or conditions will occur.